Plastic Utility Boxes: Utility Box Gray. 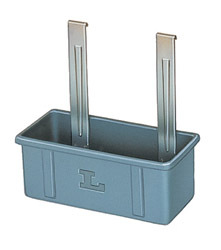 Overall size:6-3/4" W x 15-3/4" L x 6" H. Thick molded polyethylene with reinforced stainless steel shelf hooks; mounts on the end of plastic & S/S carts. *Available: Bulk pack - 6 each. Linen Cart cover: 4 shelf; 15-1/2" W x 24" L; 11-3/4"